It’s OK That The Phillies Aren’t Scoring Runs. Really. If you have watched or listened to any Phillies broadcast lately, you might have heard that the Phillies have had trouble scoring runs. The magic number of runs to score to win a ball game seems to be four; the Phillies are now 23-2 when scoring four runs or more after beating the Mets 6-4 tonight. With a record of 32-19, the Phillies are on pace for 101 wins, their first 100 win season since they won 101 games in 1977, and it isn’t crazy to think that could be plus or minus 6. The addition of Chase Utley off of the disabled list is worth about 6 1/2 wins according to Crashbrun Alley. And in a year where the Marlins are keeping within arms length and the Braves just won’t go away, those 6 and 1/2 wins could easily be the difference between the Braves’ phenomenal staff catching the Phillies or not. For instance, the Phillies won the NL East by an average of 4 games in the last 4 seasons. Utley gives the Phillies a much needed perceived boost, no doubt. As Bill Baer explains, it’s not only his offensive and defensive production that makes Utley valuable, but his value over his replacements Wilson Valdez and Pete Orr. The perception this season has been that the Phillies have been patching together a line-up, scraping runs together to win games pitched by their heroic aces. No doubt, the Phillies pitching crew, starters and relievers, have been excellent this year and deserve much credit for their success; Phillies’ pitching ranks 2nd in the NL in ERA as of this writing. But has the offense been that bad or is it part of a larger trend? To explore this, we will take a look at some basic data that may help us figure this out. Before I begin, please note the small sample size for this review. It is done just for entertainment purposes but I thought it would be neat to search for possible trends. As far as I know, this may be the first look at it on the web. The first piece of data is runs per game. I’m using runs instead of oERA here because runs can be created by making the defense make mistakes and because eventually, it would be essentially a comparison of the same number between oERA and ERA if I used oERA. 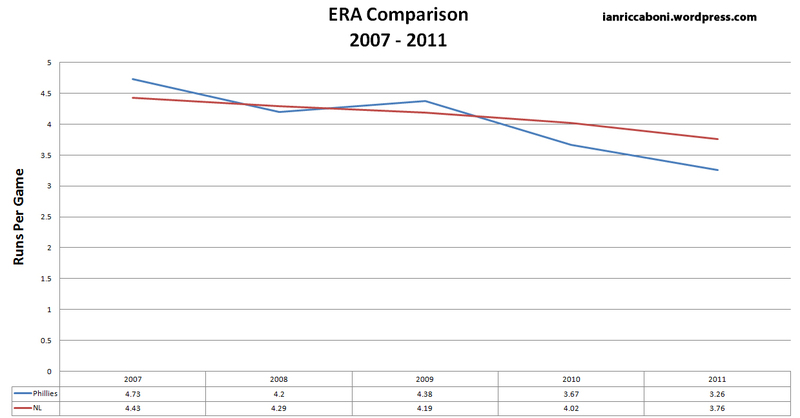 I used ERA for the pitching statistic because it is the most commonly used and most easily accessible defensive-independent available. What remains interesting to me is that their is no pattern up or down in this small sample size for unearned runs. All of the differences remain between .25 and .34 runs per game. Over the 4 Phillies’ playoff years and this year, the National League average has dropped from 4.71 to 4.1 a season, with an average of dropping .1525 runs a game season-to-season. I wish I comprehended Bill James’ win-shares better, so that I could tell you over the course of a season how much more valuable a run became from one year to the next and to point out how much more valuable a run is now than it was in 2007, but I don’t quite get it. 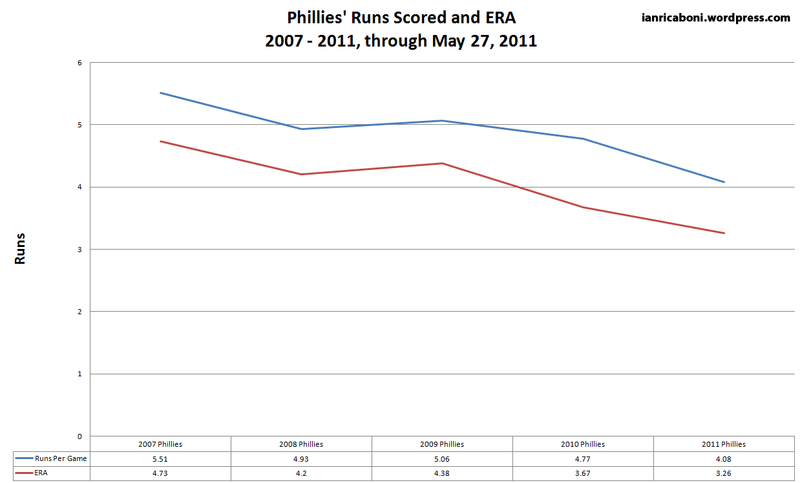 To make things simpler, compare the chart above to the one below, that of the Phillies’ runs scored and ERA. Look awfully similar, don’t they? 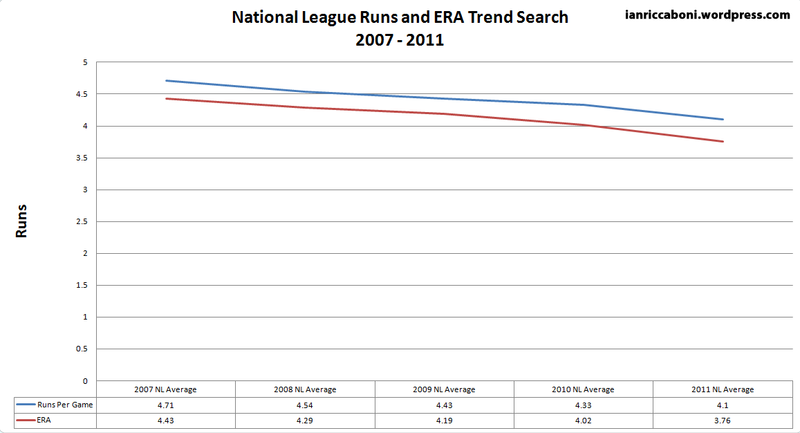 The Phillies had a Runs v. NL Average Runs differential of (.8, .39, .63, .42, -.02) from 2007-2011. The striking number, and the outlier, is the -.02. 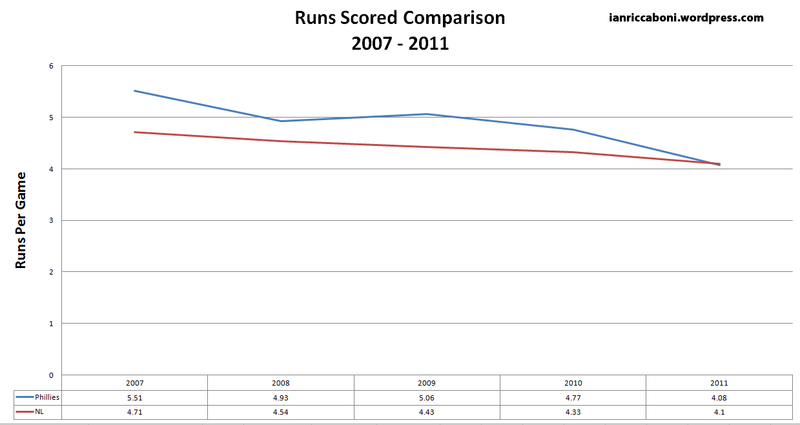 It is the only negative and a stark drop-off from the mighty run scoring teams of 2007 and 2009 and a .4 runs per game less than the differential they were putting up against the NL from 2010. The good news, and perhaps more obvious number when looking at the above graph is that the Phillies’ pitching has improved leaps and bounds since 2007. In 2007 and 2009, they needed the offensive outburst, being outpaced by the league average by -.3 and -.19 earned runs per game. In 2008, they were only .09 earned runs above the league average per game. It should come as no surprise that in 2010, a year they won 97 games, they outpaced the NL average in earned runs per game by .35. This year? They are outpacing the league average by a full half run per game.This number becomes very important in a series of discussion points that may become very confusing. With the return of Chase Utley, the advantage of Dom Brown and Ben Francisco platooning, and the regression to the mean of Cliff Lee, the Phillies are poised to capitalize on this and expand this differential further but even if it continues at its current pace, the Phillies have no reason to worry. The graphs below illustrates the trend of the Phillies v. the NL in runs scored, followed by the Phillies v. NL in ERA, rounded out with a bar graph showing the Phillies in comparison to the best, worst, and average NL stats. Would love to hear any and all Phillies’ or baseball fans’ thoughts on this. Pingback: Phillies’ Pitches Per ABs Down from Likely and Unlikely Sources « Live From Upper Gwynedd. Pingback: Chase Utley’s Return = More Runs, Wins « Live From Upper Gwynedd.